Being a technical trader in sports betting markets I have no interest in tipsters. 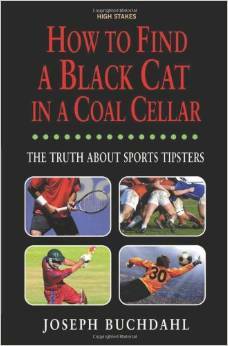 However, I do enjoy reading any mathematical book on sports betting and the mathematics contained in How to Find a Black Cat in a Coal Cellar is invaluable, even for those who don't use tipsters but develop their own trading and betting strategies. How to Find a Black Cat in a Coal Cellar is written by Joseph Buchdahl, author also of Fixed Odds Betting, another book I highly recommend. Buchdahl attempts to show those who use tipsters (also called advisories) how to evaluate their performance. Most tipsters, says Buchdahl, are either amateurs who don't know what they are doing or are fraudsters scamming people for subscription fees. Although the book is primarily for readers who want to evaluate tipsters, in effect the book is for the evaluation of any systematic approach to betting. Therefore the book is important to anyone who wishes to evaluate their own strategies as if they are tipping bets to themselves. The first chapter is a description of how various forms of betting work and how the aim is not just to pick winners but winners whose odds give you an edge in the long run. Not news to experienced bettors but you will be surprised how many people still don't understand that just picking a winner is not enough. You can't predict winners all of the time so your winners have to compensate for the losers. Hence, the odds on your winners must be higher than your predicted odds so that you gain a profit. Following on from a discussion on edge, the chapter goes on to explain the overround and how that eats into profits. The chapter also covers market inefficiencies such as favourite/long-shot bias, the over-betting of under-dogs and under-betting of favourites. Finally, the opening chapter covers staking and money management. Not exhaustively, as the author covers the subject in more detail in his previous book, Fixed Odds Betting. Needless to say, Buchdahl is against progressive betting systems such as Martingales and is pro Kelly staking for the maximisation of returns. In the second chapter, we begin to see a methodology for evaluating betting systems be they from tipsters or created by oneself. Again, some fairly familiar terms are presented; Return on Investment and Yield. Worth a read for revision, if you think you already know all about it. Many don't. A positive yield is not necessarily going to make you rich. It's not like a bank account offering 5% per annum and you get all your money back from the government if the bank fails. Buchdahl shows by way of a simple example that even a losing strategy has the potential to yield a profit 30% of the time simply because of variance. Novice traders are often caught out by apparently winning strategies that have no real edge. The chapter then proceeds to show the affect of low edge on variance. The lower the edge you have over quoted odds the greater your variance. You could show quite a run of profitable bets even with no edge at all. Worse, you could easily lose your bankroll. Also shown is that the higher the odds you bet at also affects variance. Again, the higher the odds, the higher the variance. Efficient market hypothesis tells us that market odds are close to true and so higher odds win less frequently, adding to the variance if the yield is quite low. Even if you have two systems that yield 10% profit, if one is betting at higher odds than the other then its variance will be greater than the other and will have a greater chance of losing the bankroll than the other. The second chapter continues by introducing the t-test for statistical significance. Essentially, this is giving the reader a value for the probability that a tipster made their profit through chance and not through skill. Chapter three covers value for money. Tipster subscription fees are factored into rates of return. Buchdahl looks at what the naive bettor can achieve by themselves and what a tipster can add to that. Arbitrage is covered as a way of guaranteeing success without the fundamental knowledge purportedly known by tipsters. If a tipster cannot beat simple arbitrage then they are no good at their trade. There is also an account of Buchdahl's attempt to win a last man standing competition using value betting. In chapter four Buchdahl evaluates tipsters and their records. Buchdahl goes through many tipsters and their reported success rates. I won't go through any of it here as the data is in the book and the maths used to evaluate the tipsters has already been mentioned. The level of unprofessionalism and charlatanism displayed by most tipsters is not unsurprising. Amateurish strategies involving the chasing of losses as an attempt to boost profits are evidenced. The closing down of initially profitable tipster websites, reminiscient of beginner bettors who boast of their skills on blogs that are soon left moribund when the profits start heading south. In chapter five Buchdahl makes his assessment of tipsters. Most he says, are amateurs, half of whom make a profit but far fewer than that can claim to do so through skill rather than by luck, as has already been shown mathematically. A lot of tipsters "cook the books" but after they have been verified by a tipster evaluation service, such as Buchdahl's own http://www.sports-tipsters.co.uk service, profits usually diminish as they regress to the mean. Finally, in chapter six Buchdahl shows the reader how to go about evaluating tipsters, not just mathematically, but carrying out domain checks and web searches to see if others have reviewed the tipster as being legitimate or a flim-flam artist. My review is not really enough to do justice to this book. There is so much of value to be read. The book will help you to determine which tipsters, if any, are as good as they claim. The book will also improve your own (self-tipping) strategy building. I recommend that you have spreadsheet software close to hand so that you can feed the functions provided into a spreadsheet and experiment with them. You can then have the functions on hand to remind you of the important facts contained in this book. This book certainly ranks amongst the more important books on sports betting.